Kerry-Anne and I popped in at Col'cacchio Pizzeria at Tyger Valley's Willowbridge Mall this afternoon. Col'cacchio probably serves the closest thing that you'll get to real Italian pizza this side of the equator. Instead of ordering one of the pizzas from the menu, today we opted to select ingredients and compose our own pizza. After a bit of deliberation we decided to share a bacon, black mushroom and avocado pizza. Now I did intimate above that the pizzas at Col'cacchio are very, very good - but to be honest the one we had today wasn't that great. The lesson we learned was that if you deviate from the menu and select your own toppings for a pizza, beware, you may regret it (or, of course, you may devise the most wonderful, awesome, divine pizza known to mankind). Don't you just love the cardboard envelope in which the bill was presented? Posted in General on Sunday, 31 August, 2008 by Kerry-Anne. 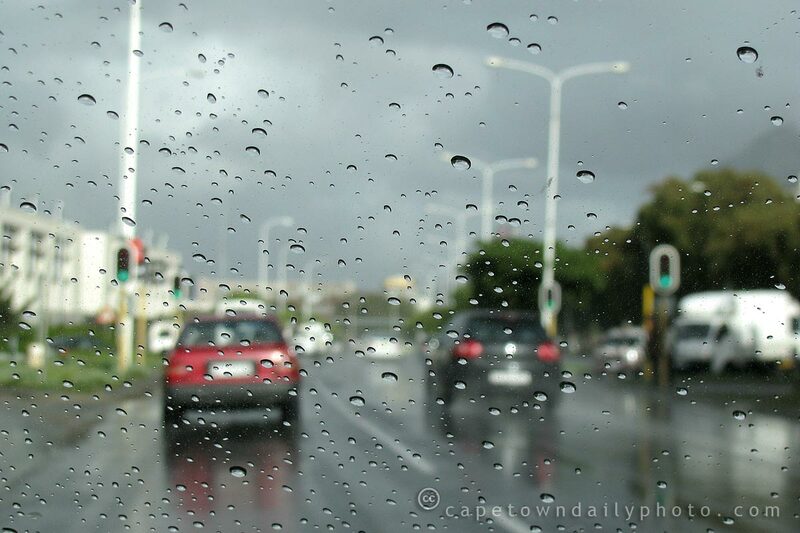 According to the weather services, Cape Town is in for one of the worst storms in 7 years this weekend, with swells of up to 10m expected along the Cape coast. 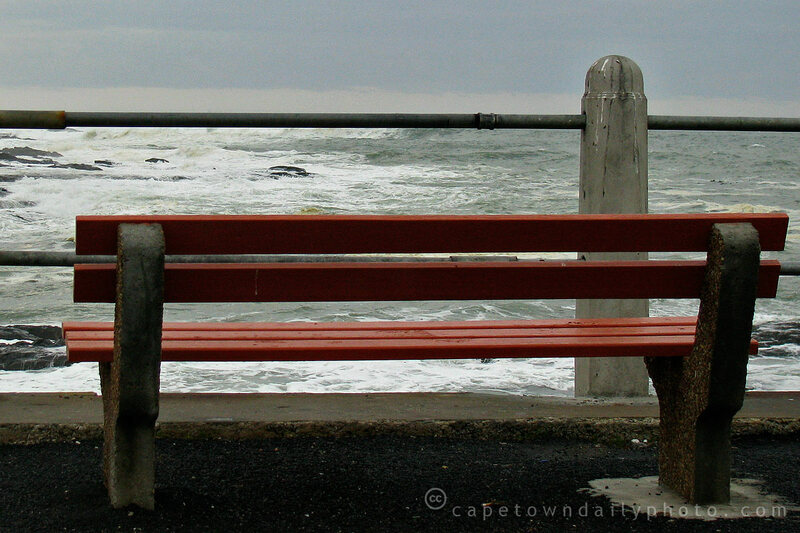 We went out to Sea Point this afternoon to get a few shots of the ocean in full rage. 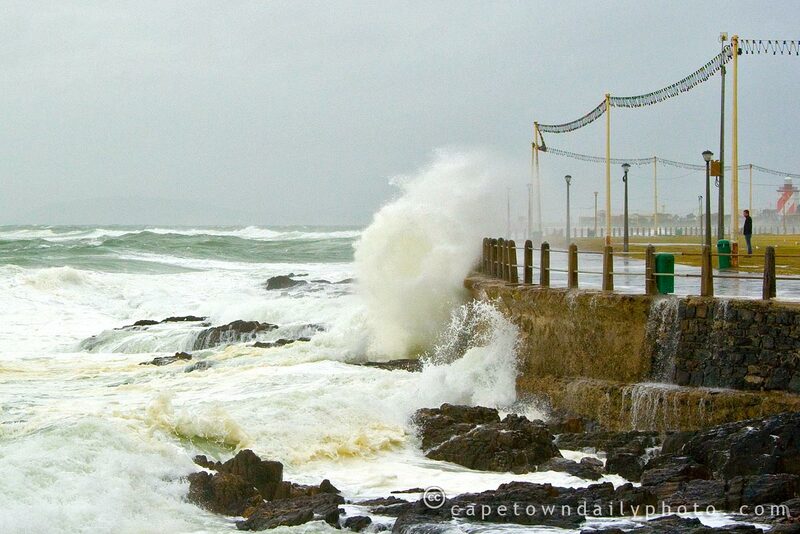 As it turned out, we weren't the only ones who had that idea: visit Cape Town Daily Photo Extras to see more photos of the stormy seas, and of all the people who braved the cold to see Nature showing her spectacular power. Posted in General on Saturday, 30 August, 2008 by Kerry-Anne. 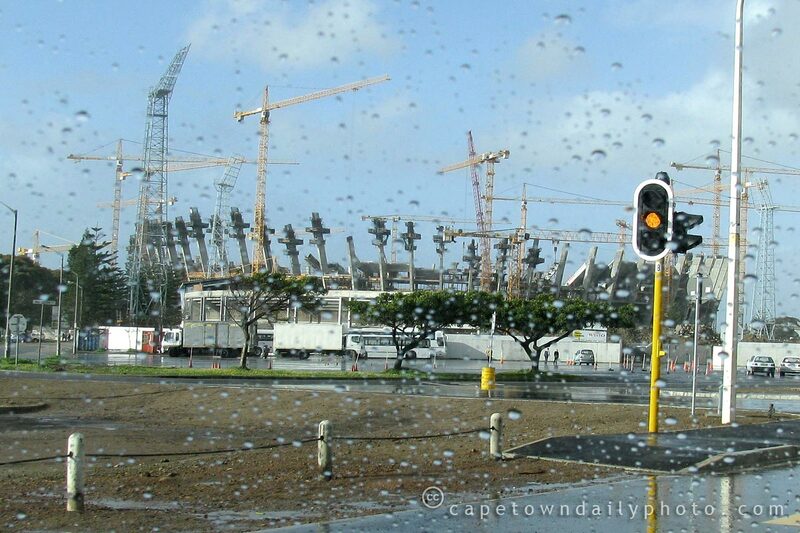 The new Green Point Stadium (being built in preparation for the 2010 Football World Cup) seems to be progressing nicely. We're going to try to get into the visitors' centre in the next few weeks so that we can get some shots from the viewing area. Posted in General on Friday, 29 August, 2008 by Kerry-Anne. Apparently winter is giving one final show before spring and summer take over for a few months. Although we observe Spring Day on 1 September, spring really only starts somewhere around the 21st of September. It's a bit of a standing joke that, no matter how beautiful the weather's been up until then, it rains on Spring Day every single year. Posted in General on Thursday, 28 August, 2008 by Kerry-Anne. It's been an exciting few days technology-wise in Cape Town - we've had quite a lot of visitors here during the last week, and a few special tech events have taken place, including Wordcamp SA and yet another 27Dinner. Posted in General on Wednesday, 27 August, 2008 by Kerry-Anne. 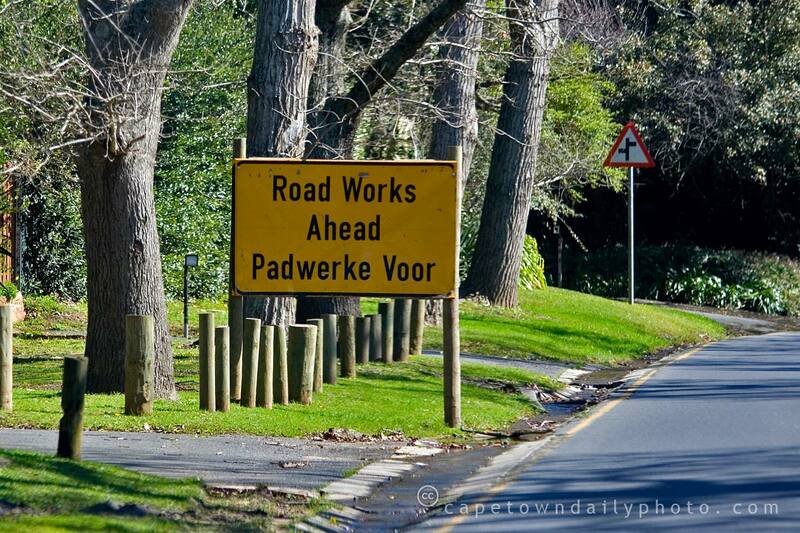 Jokes aside, you'll find these signs all over now as our roads are being prepared to receive the onslaught of traffic over the 2010 FIFA Football World Cup period, and during the expected tourism boom beyond. Kerry-Anne and I are looking forward to this simply because we enjoy meeting visitors. However, for many others, an increase in tourism means a permanent job, a stable income and food on the table. 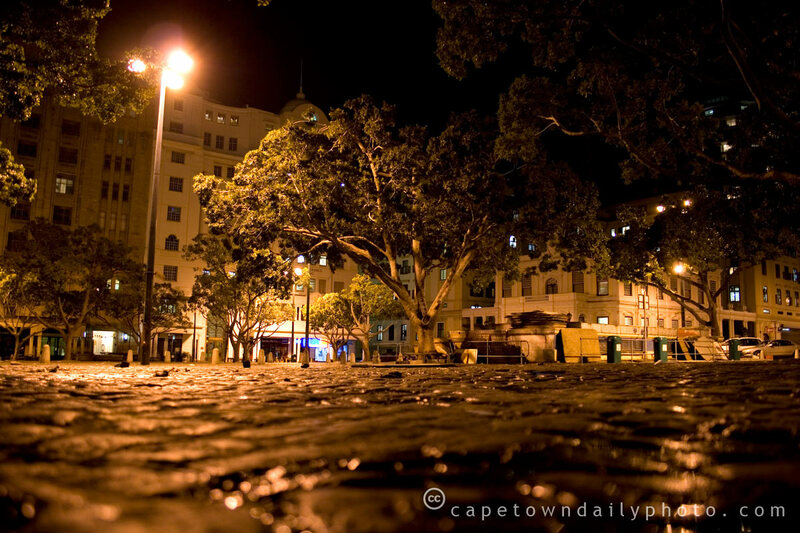 So in as much as you're blessed to experience the wonders of Cape Town, we're blessed and glad to have you visit. Posted in General on Tuesday, 26 August, 2008 by Paul. 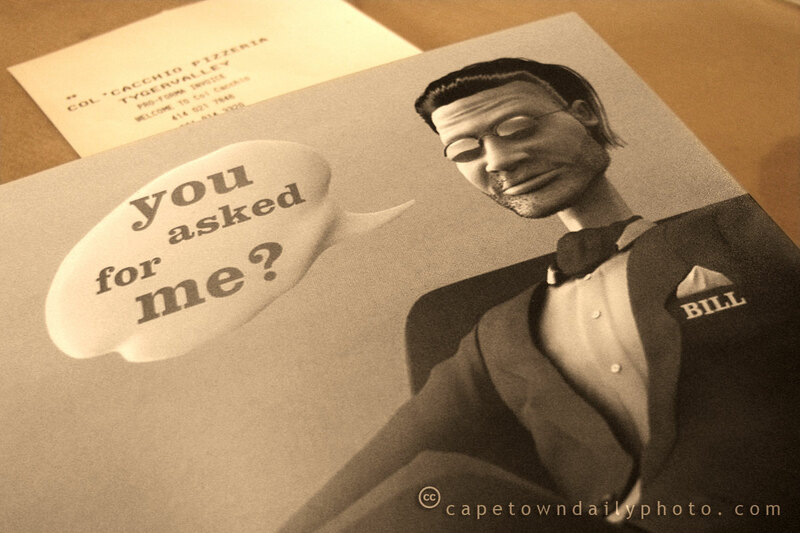 Who would have believed that little old Cape Town could make it to third position on Hasbro's Monopoly World Edition? Voting started earlier this year, and the mass of votes from Capetonians, along with many others around the world, allowed us to overtake great world cities like Paris and Sydney in the rankings. The final positions were unveiled on 20 August, with Montreal declared the top city. Riga achieved second, with Cape Town in third position (followed closely by Belgrade and Paris). 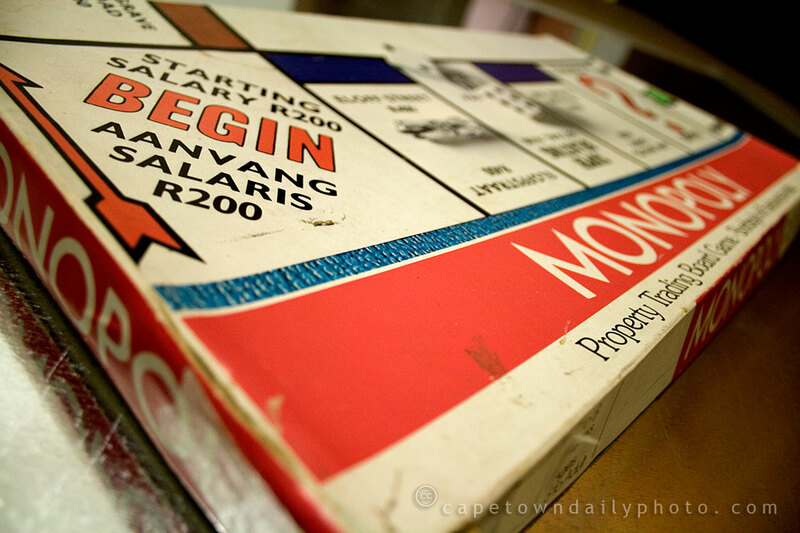 The Monopoly game in this photo is the South African edition and has been passed down from Kerry-Anne's parents to us. It's apparently seen the family through many cold and rainy winter days - as I'm sure you can tell by the well-worn box. Posted in General on Monday, 25 August, 2008 by Paul. A friend of ours took up her position in breaking the record for the largest ballet class in the world this morning. The record was first set in Cape Town in 2003, where I believe 550 dancers participated in a class. In 2006 this record was broken by 551 dancers attending a class in Pretoria (near Johannesburg, South Africa). 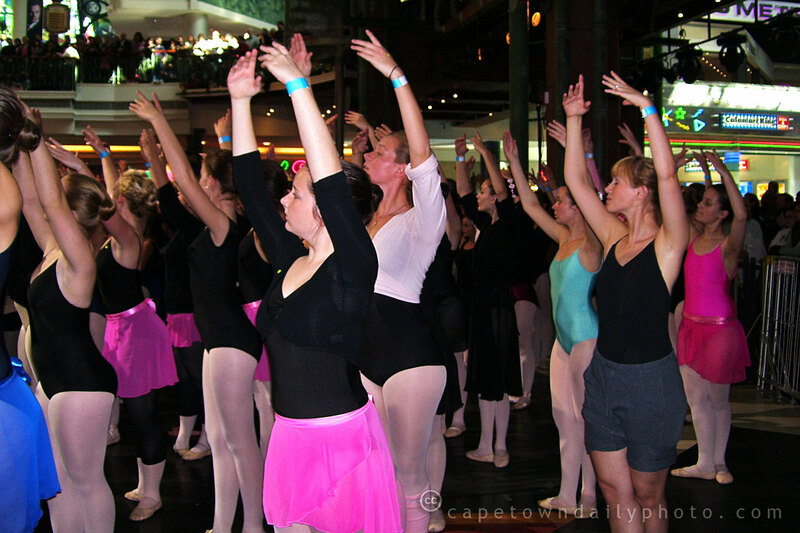 The Cape Town organisers expected between 600 and 700 dancers to arrive today; so when 983 excited dancers arrived at the Canal Walk shopping centre they were caught just a little off guard! Posted in General on Sunday, 24 August, 2008 by Paul. 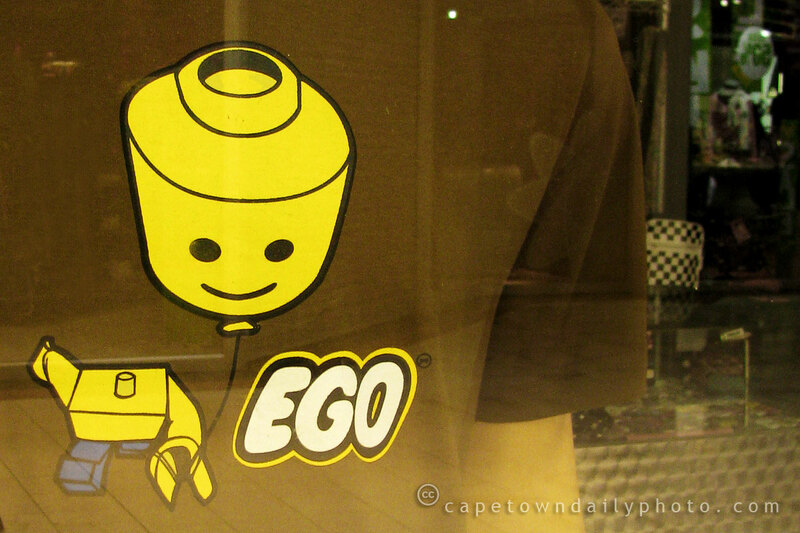 Kerry-Anne dragged me over to one of the clothing stores in the Tyger Valley shopping centre to see this t-shirt hanging in the window. Posted in General on Saturday, 23 August, 2008 by Paul. I've heard the saying, "red sky at night, sailor's delight, red sky in the morning, sailor's warning" several times before, and kinda had it in the back of my mind that it's never seemed to ring true for Cape Town. I received an excited call from a colleague on Wednesday evening saying that I should really look outside and take a photo of the setting sun. So I grabbed my camera, drove to a viewpoint, and snapped this beautifully cloudy red sunset (click the photo to see the big version). The following day's weather was terrible - it rained buckets in the morning. This led me to think of the saying, and how it should have been a "sailor's delight". 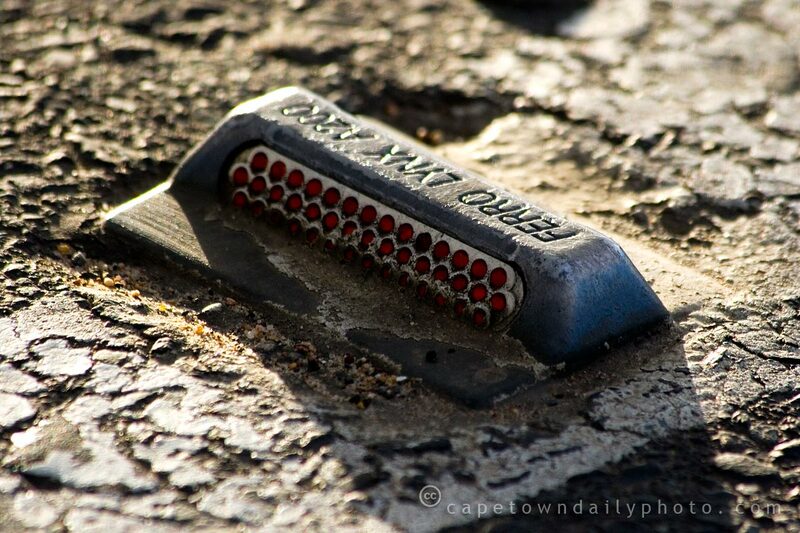 Today, Friday, I type this post as the sun is setting. The sky is again a brilliant red hue, so I just took a look at WeatherSA and guess what I found? Saturday:"Cloudy, rain mainly afternoon (60%)"! Posted in General on Friday, 22 August, 2008 by Paul. Hopefully this cold front will blow over quickly though, and we'll have more glorious blue-sky days to look forward to. Posted in General on Thursday, 21 August, 2008 by Kerry-Anne. 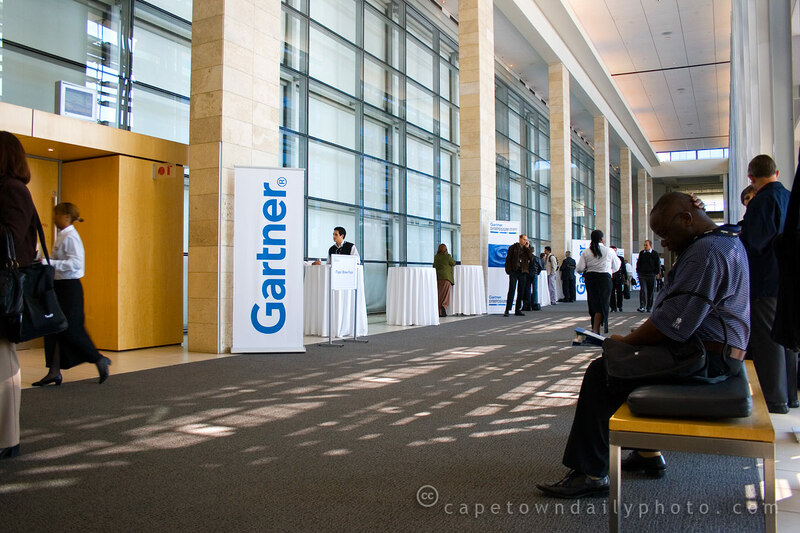 I was fortunate enough to attend a few of the Gartner sessions this week. For those who don't know, in it's simplest form, Gartner is a group of IT research analysts who try to predict future of IT and provide advice to IT professionals. I was rather surprised at the large turnout that the event had. The tickets weren't cheap (though not unreasonable) and yet the various rooms (each hosting different topic tracks) were pretty full every time (as was the lunch hall at 13h00). 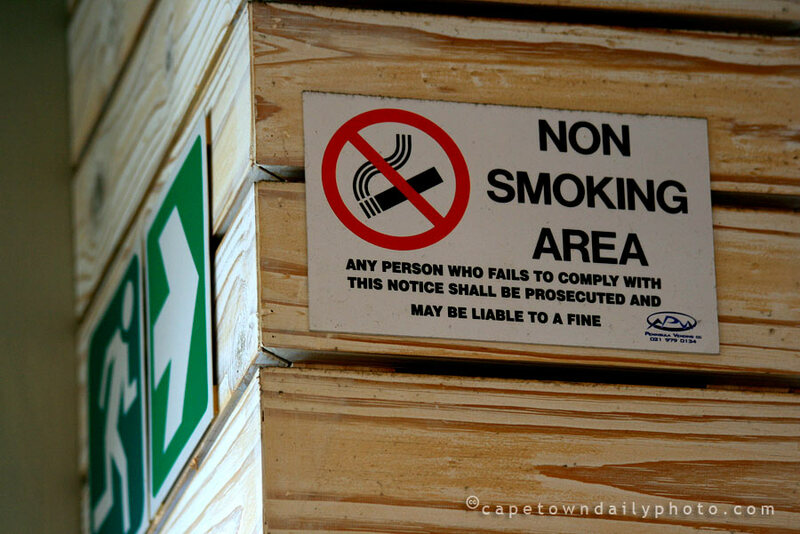 It would seem as though Cape Town's IT industry is booming. If anybody knows, I'd be interested to find out whether or not ticket sales for this event have increased over the last couple of years. Posted in General on Wednesday, 20 August, 2008 by Paul. I, shamefully perhaps, haven't been paying too much attention to the Tri-Nations rugby matches. South Africa is currently third on the log after being solidly thumped (16-0) by New Zealand at the Newlands stadium on Saturday. Our next match is against Australia on 23 August where we really need to pull off a victory. After such a disastrous loss on Saturday, we fondly think back to our past glory during the 2007 World Cup, hoping that our boys will take courage, demonstrate their skill and find the determination needed for victory on Saturday. We're behind you all the way, guys! Edit: The score was actually slightly worse, 19-0. See the comments below. Posted in General on Tuesday, 19 August, 2008 by Paul. Lyonesse Villa is located on the slopes on Table Mountain, close to Constantia Nek (for those not too familiar with the layout of Cape Town, this is the back of the mountain - the side you usually see in photos is the front). The views are absolutely incredible from here, and there are balconies all along the front of the villa to take advantage of this. 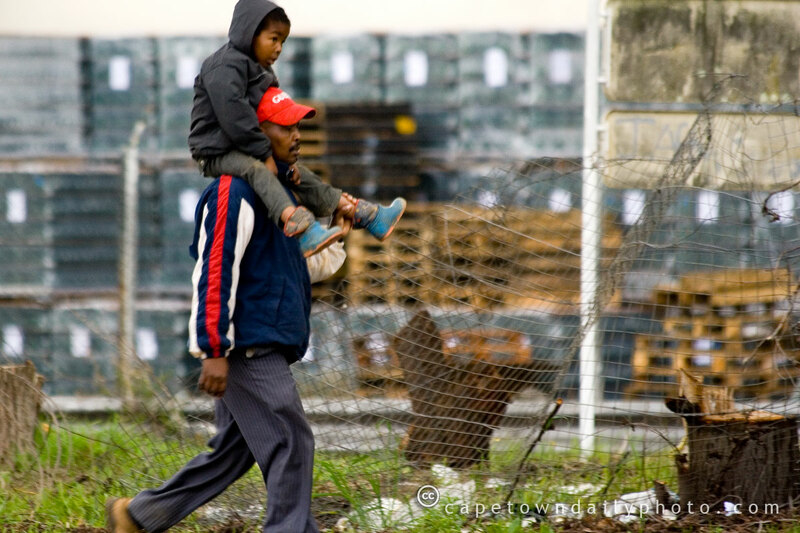 If you click through to Cape Town Daily Photo Extras, you'll see a whole lot of photos of the 2-acre indigenous garden. Seeing the wealth of colours and textures in the garden made me realise again just how diverse and beautiful the Cape Floral Kingdom is. 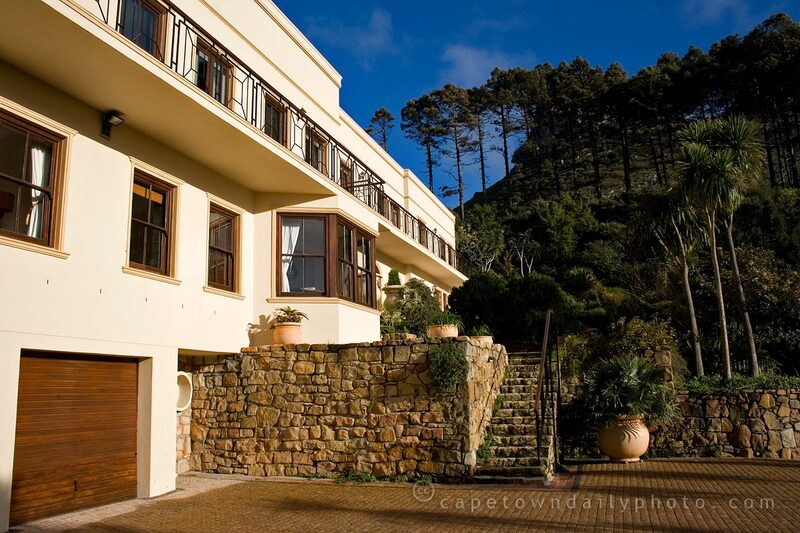 This is the last in our series of posts about Lyonesse Villa (see #1, #2 and #3, and visit Cape Town Daily Photo Extras for more photos of the house and garden). Thanks to our hosts, Ric and Robyn, for treating us to a superb weekend away! Posted in General on Monday, 18 August, 2008 by Kerry-Anne. 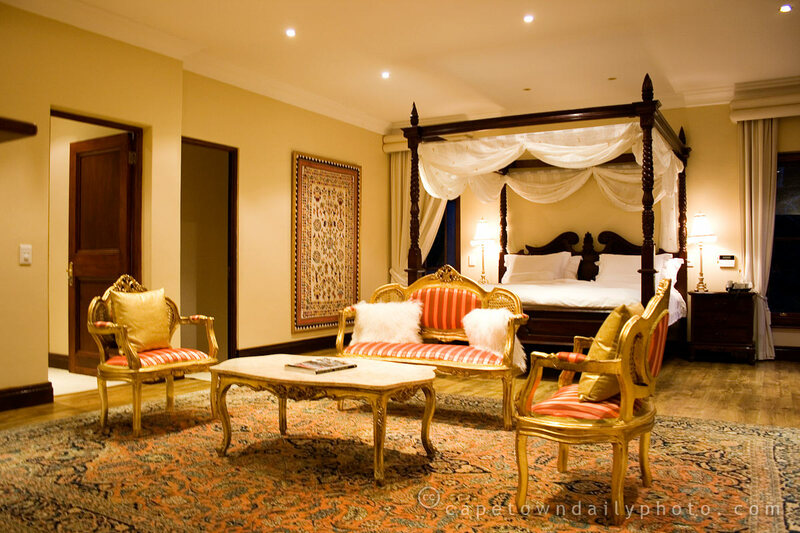 As you might have seen yesterday and the day before, Paul and I spent the weekend at the gorgeous Lyonesse Villa in Constantia. At last, Paul has finished processing most of our photos, and we can show you the rest of the property. Today we're doing the interior - the accommodation and living areas - and tomorrow we'll show you some outside shots to give you an idea of the villa's location. Each room is furnished in its own particular style and colour scheme. This lounge is one of my favourite rooms in the house (probably because I'm rather partial to pink! ), and I spent part of Saturday afternoon curled up on the corner couch with my book. Visit Cape Town Daily Photo Extras to see photos of some of the other rooms, as well as a few close-up shots of the furniture and artworks that give the villa its character and style. Posted in General on Sunday, 17 August, 2008 by Kerry-Anne. 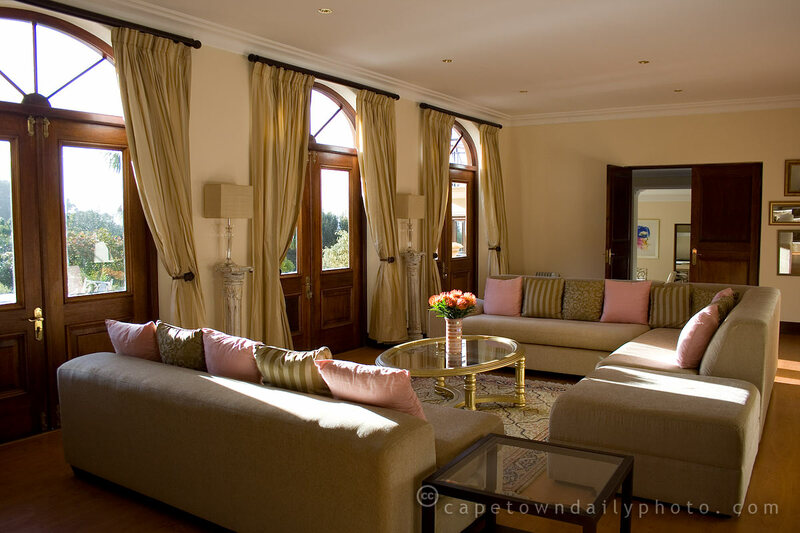 As Paul mentioned yesterday, we were badly in need of a break, and so we were thrilled to be invited to stay for a couple of nights at what must surely be one of Cape Town's top accommodation establishments: we're spending the weekend at Lyonesse, a jaw-droppingly beautiful villa in Constantia. This is just one of the bedrooms in the 850m2 house; there are eight in total, as well as eight bathrooms. I've lost count of the number of TVs... and I've lost Paul several times too. We had breakfast served to us at the 12-seater dining room table this morning; we spent the afternoon wandering around the 2-acre indigenous garden (photos of that will follow in the next day or two); and we spent the evening playing Wii Sport in the downstairs room. Apart from all the bedrooms and bathrooms, there's a fully stocked bar, an extensive library, a huge swimming pool, and a kitchen full of Gaggenau appliances. I can't wait to show you the rest of the house, but it's taking Paul some time to resize and watermark all the photos we've been taking, so you and I will have to be patient, I'm afraid. Posted in General on Saturday, 16 August, 2008 by Kerry-Anne. This weekend has started pretty well. It's been a long time since Kerry-Anne and I have been away for the weekend, so when the opportunity arose, we took it gladly. I'm not quite yet going to tell you where we are, but it's safe to say that we're still in the shadow of our beautiful Table Mountain and quite literally in the lap of luxury. 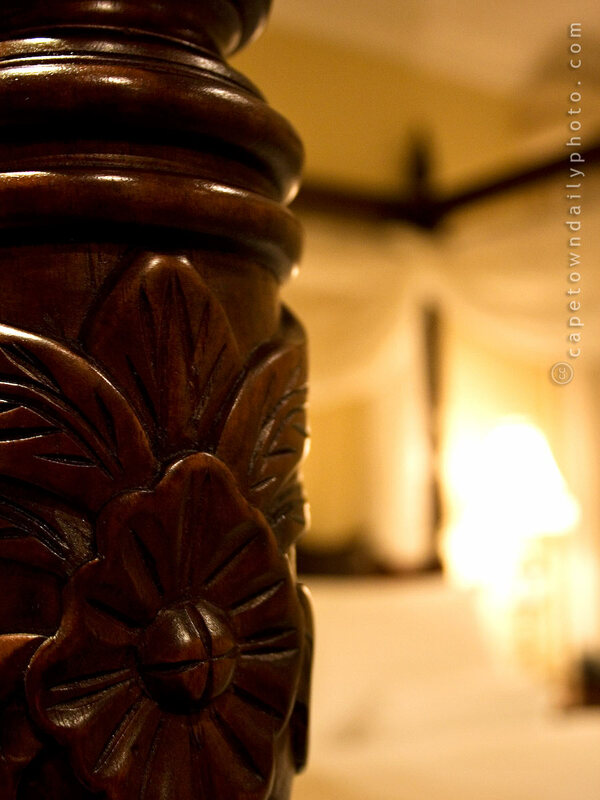 It's pretty late in the evening, so I'm about to head off to the huge four-poster bed shown in this photo. Watch this space tomorrow to find out more about where we are and how absolutely beautiful it is. Posted in General on Friday, 15 August, 2008 by Paul. It really is. I wasn't entirely convinced by all the hype... until I had a cup, and discovered to my delight that it was perfect. 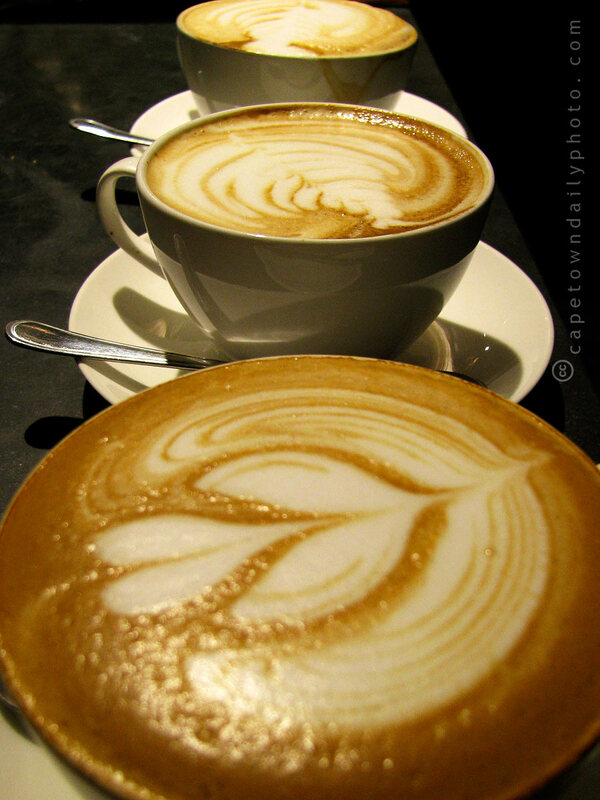 I spent the evening with a group of bright, enthusiastic and creative women at Origin Roasting in De Waterkant. It was my first time at Origin, but it won't be the last - the atmosphere was great, the staff were friendly, and the coffee was absolutely awesome. 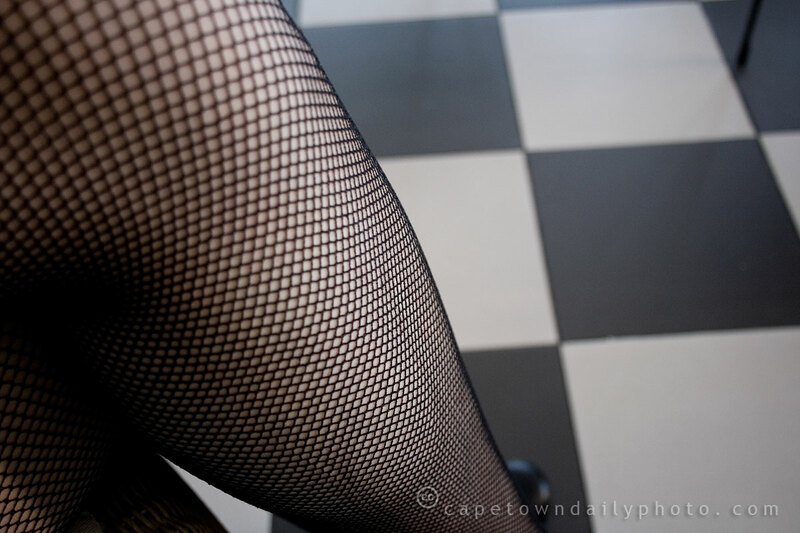 If you're on Facebook, have a look at their group, and if you're in the Green Point area, do yourself a favour and pop in for a cup of coffee. Posted in General on Thursday, 14 August, 2008 by Kerry-Anne. Posted in General on Wednesday, 13 August, 2008 by Kerry-Anne. 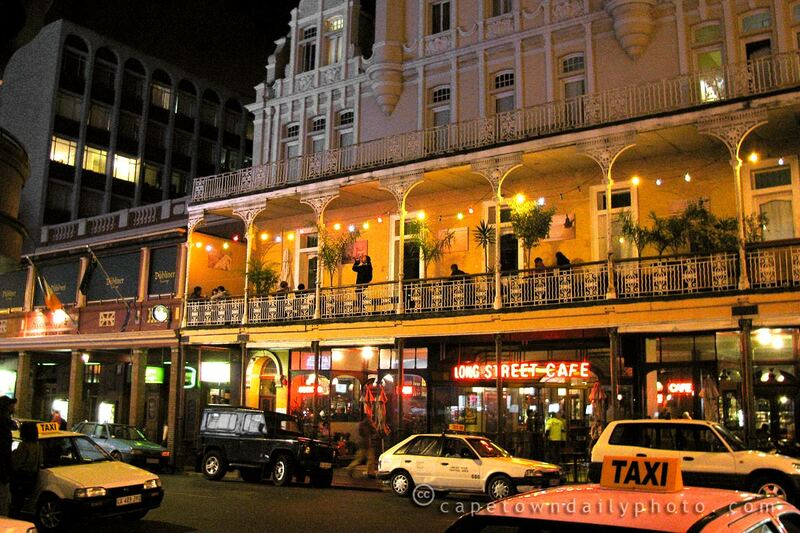 We went to another bloggers' party this evening at Long Street Café (look for the red neon sign in the photo). 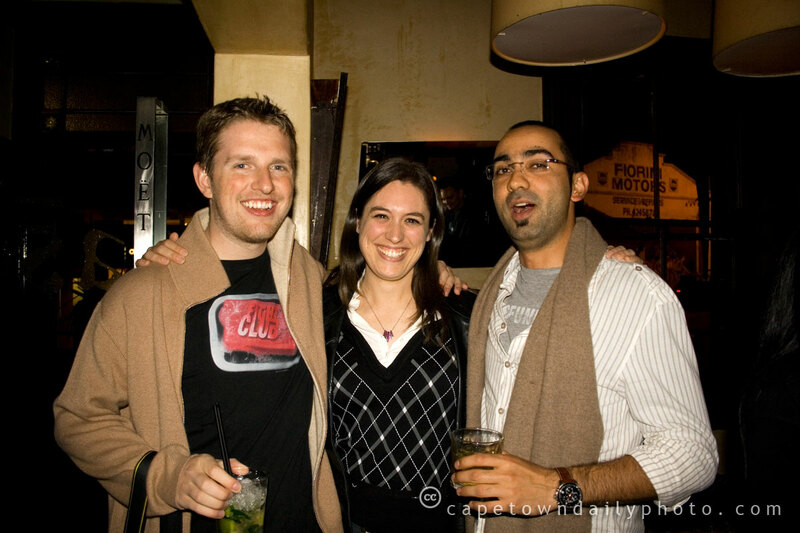 There's quite a thriving (and growing) tech community in Cape Town. In fact, two Cape-based start-up companies have just been nominated for Industry Standard Innovation 100 awards: Synthasite, the free website builder, has been nominated in the Community-Social category, and Springleap, the t-shirt design company, was nominated in the Retail category. If you think they're worthy, do vote for them! Posted in General on Tuesday, 12 August, 2008 by Kerry-Anne. 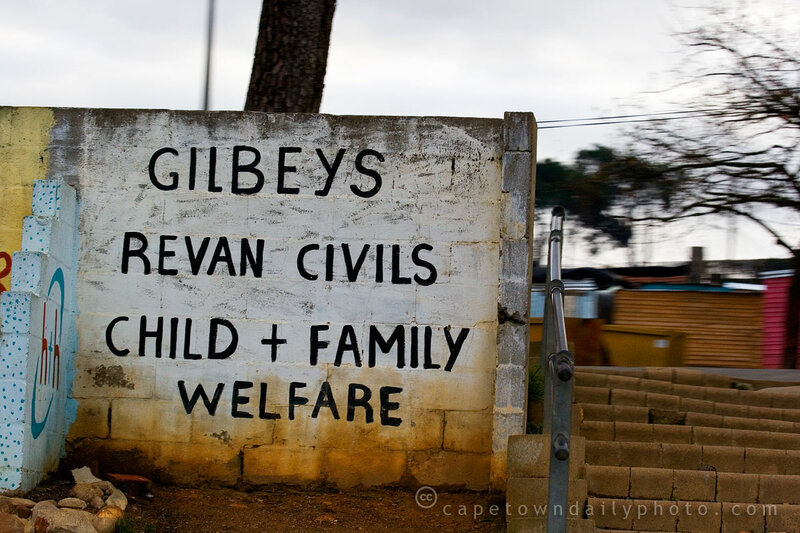 I took this photo as Kerry-Anne drove past the Kayamandi settlement (on the outskirts of Stellenbosch). I'm not sure what precisely the text is trying to convey, and if anyone can help and explain I'd be most appreciative. From what I've been able to find out, Gilbeys Distillers used to bottle alcoholic and non-alcoholic drinks in Devon Valley, near Stellenbosch. It would appear as though Gilbeys closed its doors some time back and that a couple of its senior executives bought much of the bottling equipment, hand-picked many of the good Gilbeys staff, and started Rostberg Pty(Ltd), a company specialising in the bottling of wine. Now, this still doesn't explain what the text on this wall is all about - but for some reason I really like the photo. Perhaps it's simply the colouring and incomprehensible black text... I'm not sure. Posted in General on Monday, 11 August, 2008 by Paul. 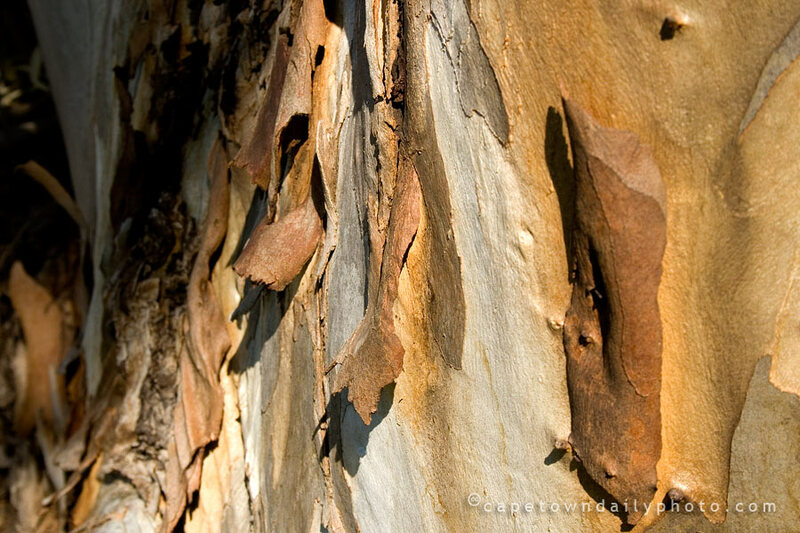 The Blue Gum tree is part of the Eucalyptus family. This Australian tree was originally introduced to South Africa by a British botanist, Sir Joseph Banks. 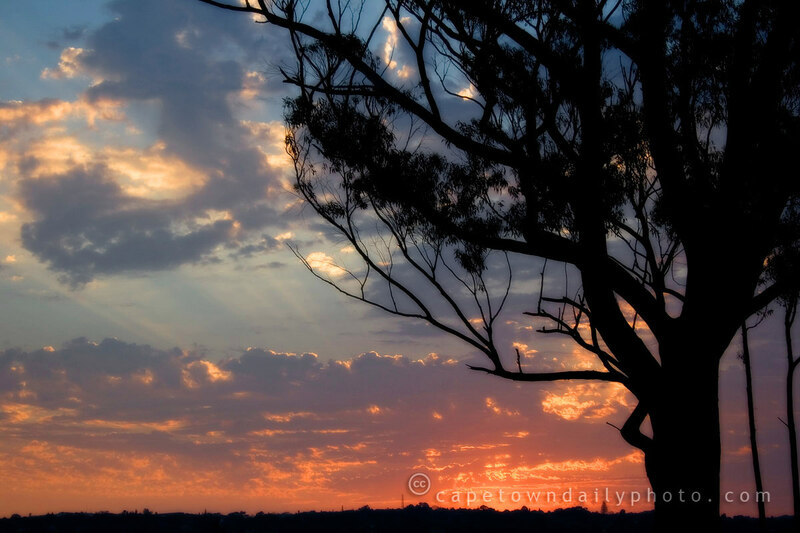 The Blue Gum grows extremely rapidly and is able to consume 2,000 litres of water per day! Interestingly, I believe that the tree was originally introduced into the Johannesburg area for the production of timber for our mining industry. I've noticed over the past few years that many large Blue Gum trees have been removed from the area in which I live. The negative impact that this tree has had on our environment has caused it to be regarded as an invader that should be removed. Posted in General on Friday, 8 August, 2008 by Paul. To get back to why I brought up Chicago: If you're visiting Cape Town at any time and would care to see a show or two, then it would be a good idea to take a look at Computicket's online booking website where you're able to book tickets before even arriving in South Africa. It's fairly simple to use and once you've booked your tickets all you have to do is collect them a day or so before the show from a kiosk in one of the listed shopping malls. Easy peazy. Posted in General on Thursday, 7 August, 2008 by Paul. 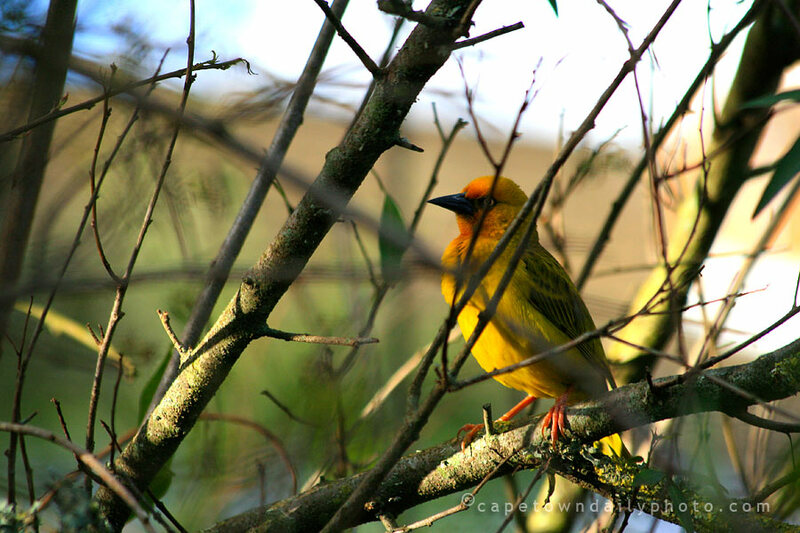 The African Golden Weaver is part of the Ploceidae family of birds. They're extremely common in the suburbs around Cape Town and most often spotted near rivers or dams, making their distinctive nests (shaped much like huge drops of water) to hang from trees. Weaver birds are given the name because of the intricately woven nests. What's interesting is that you'll most often find that the entrance to their nests face downwards, towards the ground. I remember hearing once that they do this so that snakes are unable steal their eggs. The slithery predators are forced to approach the nest from the branch above and due to the shape and location of the nest are unable to hold on to anything while attempting to enter the nest, causing them to fall unceremoniously to the ground. I wonder which was the first Weaver to think of this bright idea? Posted in General on Wednesday, 6 August, 2008 by Paul. Ships on Melkbosstrand beach? Huh? 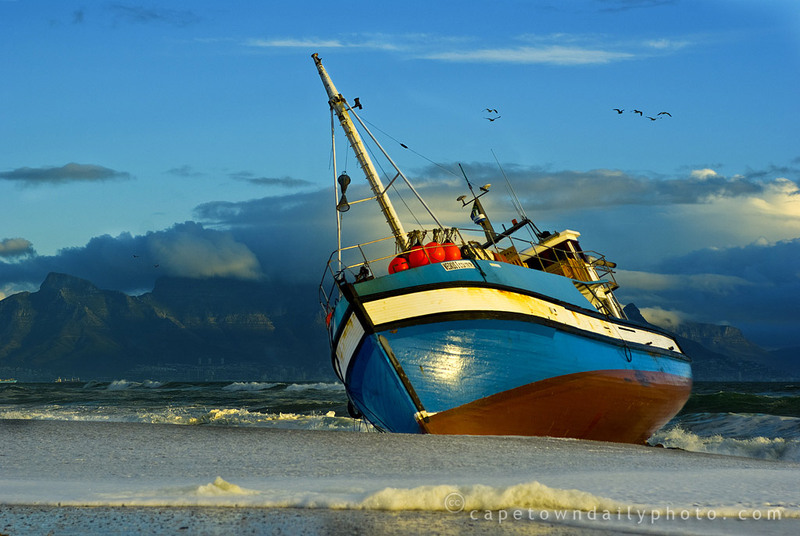 Two fishing vessels, Weskus 1 and Seawin, became stranded at Kreefte Bay (close to Melkbosstrand) late last week. Apparently one of the two was in trouble and the other tried to help out, but ended up running aground itself! The salvage operation is underway, and all pollutants have been removed. The next steps are to dig sand away around the vessels and then to use tug boats at high-tide to tow the vessels back into the sea. Posted in General on Tuesday, 5 August, 2008 by Paul. 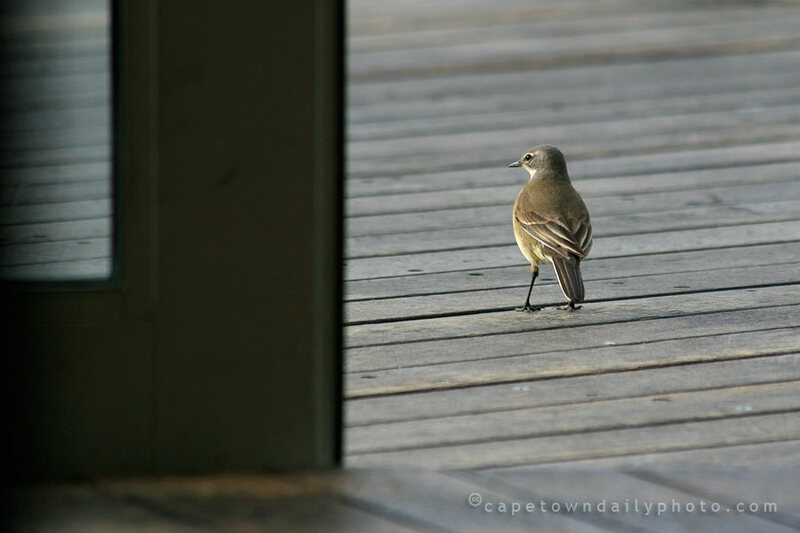 This tweetie-bird was wandering in and out of Cafe Neo, a popular place for drinks or lunch. Cafe Neo is popular for its open, light feel and perhaps especially for the fact that they offer free wireless internet access. When visiting I've always noticed at least two or three people sipping drinks while typing away on their laptops. 1. If you're using Windows, always turn off "File and Printer Sharing". Not doing this could allow bad people to download files from your computer. 2. Make sure that you're using a proper firewall. If you're using Windows Firewall, I would consider installing a second higher-rated firewall like Sunbelt Personal Firewall, Comodo, or ZoneAlarm. Not doing this could similarly allow bad people to do all kinds of nasty things to your computer, including stealing your files. 3. Never allow your mail client (e.g. Outlook) to download your email unless you're absolutely sure that the client is doing so over a secure channel (which it generally is not). Not doing this would allow bad people to view your mail account's username and password. 4. Whenever using an Internet banking website, a facility like PayPal, or your webmail account, etc. always check the server certificate of the website to make sure that you're not seeing someone's fake website. They really look like the original - you cannot tell the difference just by looking at them. 5. Make sure that your computer's operating system is properly patched. For Windows users this means that Windows Update must be active and you must allow it to install patches. If you're a Linux user you're better off to start with, but don't be fooled, Linux is also vulnerable to attack - be sure to keep your OS patched. Please feel free to leave a comment if you have any helpful tips for safer surfing when using open wifi. Posted in General on Sunday, 3 August, 2008 by Paul. Greenmarket Square was built way back in 1696 and at the time was (disgracefully) used as a slave market and later a vegetable market. In the 1950s it was apparently (though I wasn't around to verify this) used as a parking lot, and only in the 1980s was it converted into a craft and flea market for informal traders. The area is super-safe during the day, though I'd keep a wary eye open for suspicious-looking people at night. This said, I felt safe enough to whip out my camera and take a few photos of the deserted market area. Posted in General on Saturday, 2 August, 2008 by Paul. 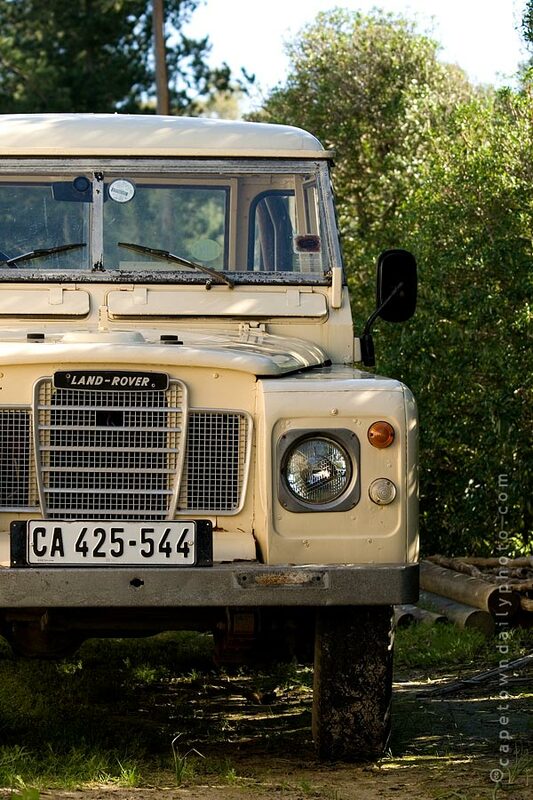 Speaking of Perdeberg (see yesterday's post), here are two horses of a different kind ("perd" is Afrikaans for "horse"). 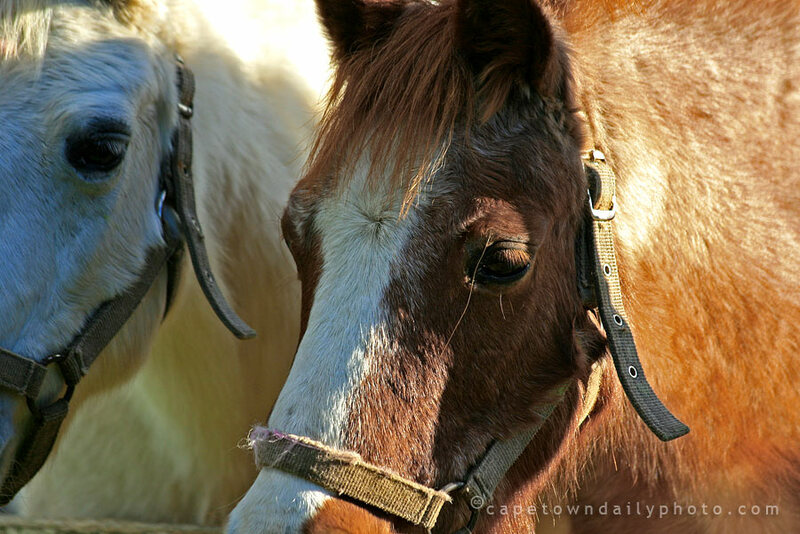 These two ponies live on a little smallholding in Joostenbergvlakte (about 40km outside of the city, between Bellville and Stellenbosch). They spend their days grazing on tufts of grass and taking kids for rides. I wonder if they get as much fun out of these rides as the kids do? 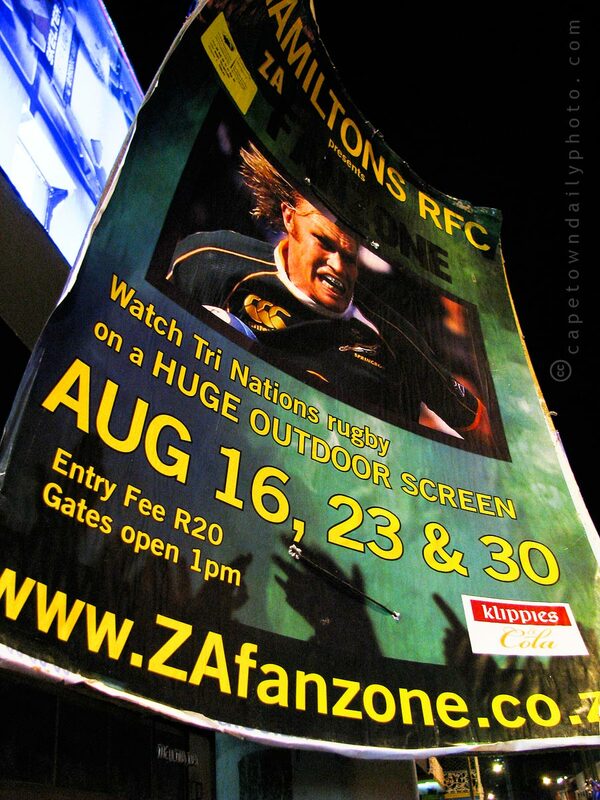 Posted in General on Friday, 1 August, 2008 by Paul.